Making silicon chips for microprocessors isn’t an easy life as the new HEWSON CONSULTANTS game Technician Ted shows. ROGER KEAN talks to ANDREW HEWSON and STEVE MARSDEN who, together with DAVE COOKE, wrote Technician Ted, a CRASH SMASH this month. SINCE their emergence from the early days of the arcade copy, Hewson Consultants have been noted more for their thoughtful programs like NightFlite and Heathrow ATC. Even the more arcade-like games in the Seiddab trilogy by Steve Turner have been thinking games as well as shoot em ups. 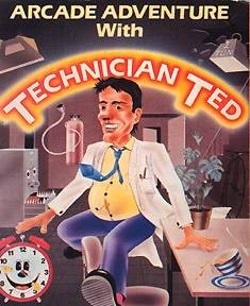 So it comes as a surprise to see the latest release from Hewsons, Technician Ted, which is an exciting platform game. 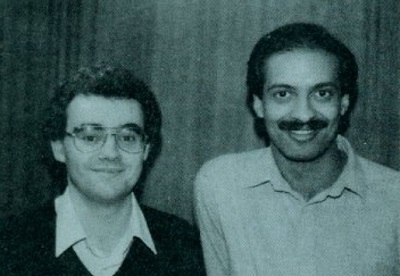 The two young programmers of Technician Ted are Steve Marsden (21) and Dave Cooke (23). Dave was unfortunately at work on the day that Steve and Andrew Hewson came up to Ludlow to see us. I started off by asking Steve how many games he had written. Both Steve and Dave work for a giant electronics firm which, as Andrew explained, is where the game idea first came from. ‘It’s based on the chip factory where they work in Marconi in Lincoln, a place where they make micro- processors, and one of the rooms where Steve and Dave work is the silicon slice store so they’re in deep with these chips anyway and so machine code is nothing new to them. ‘So you make chips for Marconi?’ I asked, and then wondered whether Marconi was aware that two of their employees were ‘leaking’ trade secrets through a computer game. Steve gave a laugh. ‘I’d like to think they could do, yeah, because then we’ll know where we’re going wrong,’ he said, adding a laugh. Andrew added, ‘He takes a sheet for a routine and then the routine is written out on that sheet and the interface is at the top, you know, what it’s got to do, and then all that goes into a folder. Whereas Steve Turner is all hex, I don’t know how he does it. Most of it’s carried up here,’ he said, tapping his head wonderingly. Refused permission to see the top secret document, I asked Andrew about playing tips. Talking of Steve Turner, I asked Andrew how the follow up to Avalon was coming along. It’s called The Dragontorc of Avalon. ‘Dragontorc? Yes it’s coming along quite well. I’ve got a couple of screen shots here. As you can see it’s mostly developments isn’t it? No doors this time, instead you have stone circles and trees coming in. In a sense it’s Avalon Mk II — there’s Maroc sitting in the middle and there’s other characters. He’s still got his servant spell, and you’re going to be given a few other spells to begin with. And this time the scenario is set rather later on. It follows on from Avalon, but you’ve got to reunite the five crowns of Britain. The enemy this time is Morag the Shape Shifter. It should hit the streets about March the 1st — that’s the target date, but we’ll see,’ Andrew added with a hopeful shrug.